A scenic and challenging loop around and over the Jura mountains from Geneva. We started in Bernex, near Geneva, and headed directly towards Bellegarde. 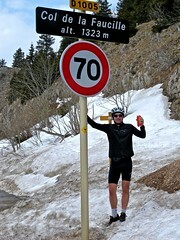 From Bellegarde, the Col de Menthières is a great climb. Now that the little ski station is closed, this wide, well surfaced road is completely deserted. At the top, to our surprise we found that the other way down hadn’t been plowed. Oh well, we have become experienced snow pushers. Perhaps 3 kms sinking into deep and wet snow. After finally descending into the valley, it’s then a long beautiful – slightly uphill – stretch with high mountains on each side, ending with five slightly steeper kilometres before reaching the Col de la Faucille. My second metric century of the year, and over 2000 metres of vertical climb. Great ride and yes, I will sleep well tonite. When are you going to replace your 2008 Challenge Update with 2009? I’m curious how you are doing against your ’09 target of 100 different cols. I reckon that you must already have reached around 20. Nice ride. Bare legs in the snow? Love the fact that Eric carried a beer all the way. Et voilà une idée de parcours, intéressante je pense, si vous êtes à cours d’inspiration ! Au départ de Bellegarde, faire l’ascension du belvédère des avalanches, puis prendre la route-piste forestière qui mène vers le col du merle pour rejoindre la route de la Pesse (avec détour possible pour le Col de la Sémine) puis au nord jusqu’aux Mouilles et prendre à droite pour aller à Bellecombe (route et endroit magnifique, vues sur les sommets, tranquillité…). Continuer sur le D292, puis Lajoux, descente sur Mijoux et direction au sud par Lélex en légère descente. A chézery, faire la très agréable ascension du Col de Menthières. 114km on a hybrid = 150km on a road bike. a beer before descending ? Will, it helped! Stijn Devolder (QST) won his second Ronde van Vlaanderen, repeating his solo break-away just like he did when he won last year. Cheers! 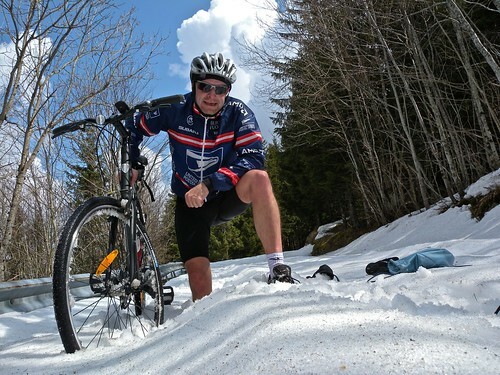 Groover : as the temperatures were decent (nothing like some of the rides we did this winter), bare legs in the snow are not too cold (feet is another story). The only trouble is that the snow has iced up and therefore it (litteraly) scratches up your skin after a while whenever you sink deeper into the stuff. Result : red skin from the cold with some minor bleeding cuts (nothing bad though). I love the crazy adventures. Bast : merci pour les idées. Il y a effectivement plein de belles routes à faire là haut. On essayera certainement bientôt, surtout puisque je n’ai même pas encore le Col de Merle sur ma liste de cols. 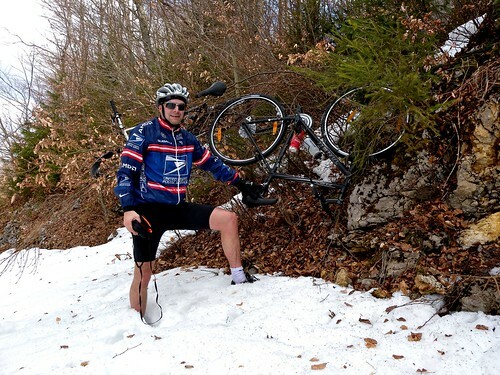 Will n’arrêtes pas de me dire “Bientôt Eric, faut attendre que la neige fonde un peu”. Bastien: Merci pour les idées!